The spectral characteristics of the background radiation emitted by a miniature inductively-coupled plasma (i.c.p.) are carefully examined and methods for reducing undesirable features discussed. The complex nature of the background emission spectrum for the mini-i.c.p. indicates that careful line selection criteria and background correction procedures should be employed. 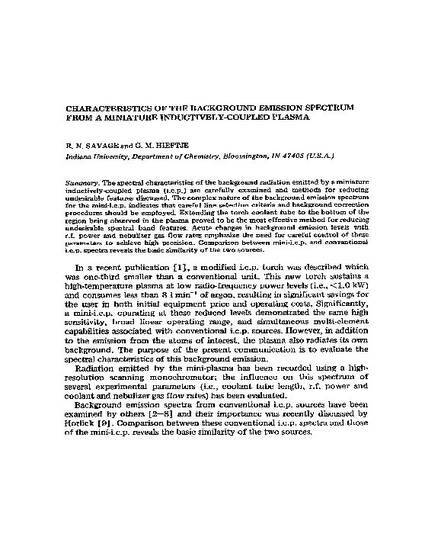 Extending the torch coolant tube to the bottom of the region being observed in the plasma proved to be the most effective method for reducing undesirable spectral band features. Acute changes in background emission levels with r.f. power and nebulizer gas flow rates emphasize the need for careful control of these parameters to achieve high precision. Comparison between mini-i.c.p. and conventional i.c.p. spectra reveals the basic similarity of the two sources.